When medical marijuana patient Shaun Smith won his case with a ten minute not guilty verdict in June, he could not have known the District Attorney had already spent the cash they took from his medical cannabis collective and that the Sheriff’s department would take such a long time to return the motorcycle confiscated from Shaun’s home. But, both Bonnie Dumanis and Sheriff Gore have so far failed to return the property of a vindicated citizen. 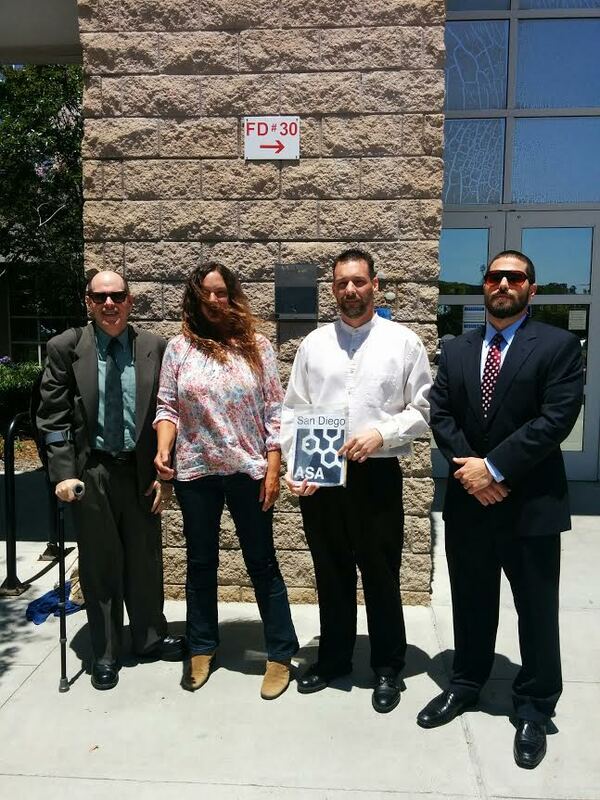 In June, Shaun’s case moved through the San Diego North County courthouse very quickly and within 10 minutes a jury had reached a verdict of not guilty on the possession for sale and manufacturing charges the DA had levied after a raid on Shuan’s Oceanside home. Shaun was operating a legal collective and the group was saving for a storefront location. At the home invasion, SWAT-style raid, Team 9 of The Narcotic Task Force took over 43,000 of the collective’s cash on-hand, and what they felt were his assets, then rode to the bank and confiscated the 110,000 from the collective’s bank account. Shaun and his lawyers have been trying to get the property back since the not guilty verdict was delivered. Nearly two months ago, the Honorable Harry M. Elias ordered the San Diego County Sheriff’s Department to return the $153,750.00 and a Yamaha motorcycle to Shaun. When the property was not immediately returned, the Law Offices of Michael E. Cindrich, APC, requested that Judge Elias order the District Attorney’s Office to answer for the delay. On Friday October 14, 2016, Judge Elias did just that; the DA’s Office was ordered to appear before the Court and show cause as to why the property had not been returned. During the hearing, the DA’s Office conceded that it purposefully delayed in processing the necessary documents to release the property because it was evaluating whether to appeal the return of the collective’s currency. Also, the Sheriff’s department was temporarily unable to locate Mr. Smith’s motorcycle. Today the Court upheld the longstanding principal that ‘justice delayed is justice denied.’ With the modified order we look forward to the District Attorney’s Office doing everything in its power to ensure that Mr. Smith, a county resident, is not deprived of his property one day longer than necessary. By Friday afternoon the Sheriffs Department had located Smith’s motorcycle and is making it available for pickup. It appears that the government was expecting to succeed in forfeiting the seized money. If successful, the money would have been allocated to the DA, County, and Sheriff. As it stands now, the cash was absorbed into the law enforcement machine and is so entrenched in what the DA calls “hers” that it is requiring multiple agencies to sign off on its release — as if it were already forfeited. Until it the collective’s cash is returned this should be considered a case of theft. It appears that law enforcement and military contractors are often examples of big government agencies whose abusive practices could bring bipartisan cooperation between us lefties and conservatives. They should pay interest from the day of the not guilty verdict.